Organisations often have “sufficient data” to manage their IT services. However, it is available in raw formats, spread out across multiple tools, and managed out of different divisions or departments. Many technical platform management and monitoring tools, service desk or business management tools such as ERPs are, among others, valid sources of information when it comes to calculating real-time IT service performance and it’s alignment with business requirements. So, Obsidian gathers data retrieved from multiple sources to calculate service level and business process indicators, providing a comprehensive platform for modelling of IT services. Obsidian is a Business Service Intelligence & Analytics platform, also considered a second generation BSM platform. It was mainly designed to help aligning IT Services with business objectives. It provides real-time, historic, and predictive metrics and indicators through innovative dashboards and reporting. Obsidian provides a holistic view of IT service performance. Therefore, it allows to monitor and improve its alignment of IT services with business objectives. In addition, tt combines powerful many out-of-the-box features with advanced design tools for the creation of custom dashboards and reports to match all user requirements. Architectural modelling of IT services, their dependency on other internal and external services and their impact on business processes. Multi-threaded calculation engine allowing parallel calculation of real-time indicators for multiple services and their impact on business processes. Out-of-the-box dashboards and reports, in addition to visual design tools to customize for any type of requirement. 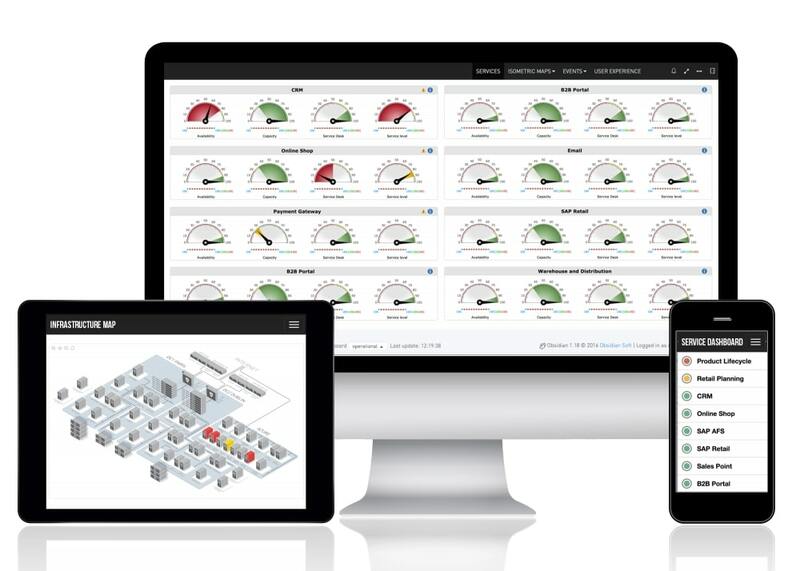 Don’t hesitate to contact us to request more information on intelligent service monitoring with Obsidian. In addition, you can subscribe to the Obsidian newsletter or to the Obsidian YouTube channel. It currently has 1869 subscribers. Consider also reading our blog and news sections for further insights about Obsidian. Finally, you can follow us on linked-in, facebook and twitter.